This affordable lab water system produces 18.2 megohm-cm ultrapure, reagent grade water at a flow rate of 2-Liters/minute. Continuous recirculation is utilized to maintain maximum water purity. Therefore, ultrapure water is instantly available on demand up to 7 feet from the system via the included hand held remote dispenser. The digital Conductivity/Resistivity monitor displays the water quality and a Green LED indicates that the water quality is above the acceptable purity. When the water quality drops below the desired purity, a Red LED alerts the user that it is time to replace the filters. The system is simple to install and easy to maintain. The cabinet can be bench, shelf or wall mounted without the use of costly wall mounting brackets. It has a 2-year warranty in most countries and is proudly made in the USA. 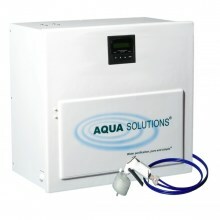 A High Flow/High Capacity (8-12 Liters/Min) version of this system is also available (see Model: 2035A). Designed for use on feed water pretreated via reverse osmosis and/or ion exchange and contains less than 20 PPM of total dissolved solids. All AQUA SOLUTIONS Analytical Grade Type I DI Laboratory Water Purification Systems produce purified water that meets or exceeds ASTM, CAP and CLSI specifications for Type I reagent grade water. I would like to request a quote for All Type I Systems.